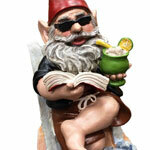 GardenFun is your one-stop gnome marketplace for the latest mankini-clad statues. Customers love seeing their favorite white bearded gnome dressed in a Borat-style swimsuit. They will say “OMG!” or “Oh my Gnome!” Each mankini gnome is wearing a pair of super-cool shades to protect his eyes from the sunlight. 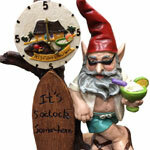 Add one of our warm-weather gnomes to your pool deck to join the fun, or to add a bit of humor to your gardening. Shock your grandparents with a mankini gnome for any special occasion. From birthdays to bar mitzvahs, there’s no better present than a GardenFun favorite mankini gnome! Blue Mankini Gnome - OMG! Crossfit Mankini Gnome - OMG! 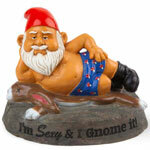 Nothing says “I love you” like a barely-dressed garden gnome from GardenFun. 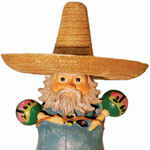 Our funky gnomes are decked out in summer gear, from bright colored hats to matching flip flops and sunglasses. 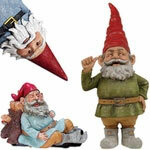 Take your gnome collection to a scandalous new level with these OMG! styles. Choose from a range of 12-inch characters that will fit into your indoor or outdoor decor. 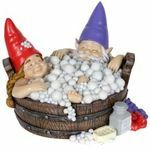 While these bathing gnomes are often found poolside, they’re also a cute addition to summer homes or for a summery reminder inside during cold winter months. 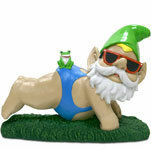 Some of our customer-favorite mankini gnomes feature fun activities, from sunbathing to yoga. Our yoga-posing GardenFun gnomes feature round-bellied grandfather gnomes in various yoga and exercise poses while gardening and playing outside with frogs and butterflies. Give the yogini in your life a hilarious gift that pokes fun at their exercise of choice. 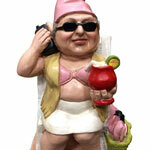 The sunbathing gnome, complete with pink skin and tanning bed goggles, is perfect for your bronze friends or family. Choose from our growing selection of free spirited mankini gnomes to secure your position as the jokester of the office. Purchase one of these for a perpetual talking piece at home or at work. 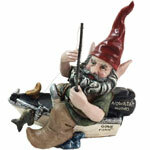 Visit GardenFun for outrageously funny garden gnomes for any occasion and any gardening or yoga enthusiast.